Thanks for an awesome day everyone. Special thanks to Don Lane and Andros for all the TD support. With respect Amateur (AM) winnings and players packs. All AMs are receiving a $15 players pack($5 food and beverage and $10 credit). Unfortunately Ettyville currently does not have Merchandise in stock to have put a full players pack together. We will provide options. We have Merchandise forthcoming for 10th Anniversary plastic and the Provincials event. ALL am payouts can be merched out through your Ontario Provincials registration OR if not attending I will merch out with a 10th anniversary plastic if you prefer. I truly hope this works best for everyone with the Provincial interest that was present and a lot of AM1 players not needing new plastic. The redemption of these credits will happen offline to the Provincials registration process which is automated through the ODSA. Payouts and credits listed below. Most likely in for just the Saturday shtuff. Sunday the course is open and available for play for anybody coming from out of town wanting to practice it. No charge for Tournament participants and I'll organize a tractor doubles if people want. I will be pulling the extra stops to make this event. Camping Friday. Driving home Saturday night. I will play Pro as that is where I would have the most fun. Awesome and thanks Shane and Don. I'm hopeful to make it for the AM2. I think this will happen. I'll probably not play on Saturday and be looking for a round. I'll get a few more details up early next week. I might send the wife to the inlaws so this could go to a whole new level. List updated with some of the Peterborough gang and Oz. Some may be tentative but that's cool. Decide right up to the end of registration is cool with me on this tournament. Camping is free this weekend as well. Are there Provincial passes for each Division? Example one given to AM1 winner and AM2 winner? Crap, if I have to play Chris, I'll never have a chance to qualify. I'll give it some thought (giving you props Chris for being that good). I'll probably go in any event though, what's $50 right? 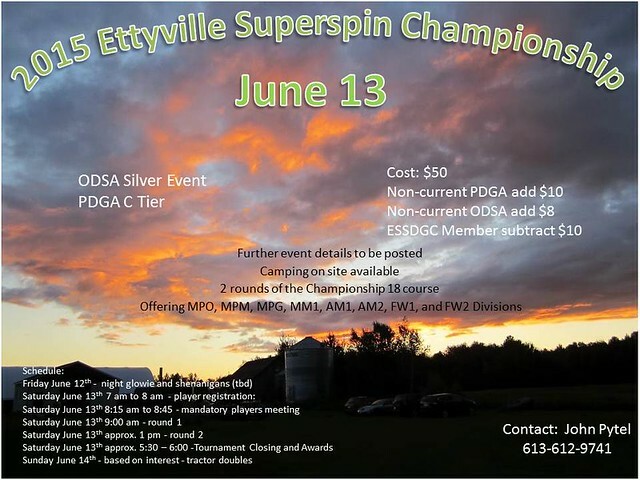 That's $60 if you're not a current PDGA member. There is a Club pass the ODGC will be giving away. If it's for adjusted score for one of the rounds then you just have to beat your own game on this course. You'll probably find this course a little different then some of the others. Hope to see you out Mark.